The following is an interesting and informative article that appeared a few months ago in the "Moscow Defense Brief" journal. Written by its chief-editor Mikhail Barabanov. I believe the subject deserves a thread of its own. Moscow Defense Brief serves as a comprehensive and reliable source of public information and unbiased analysis on all aspects of Russia's policy and activities in the security and defense spheres. The magazine is an important resource for foreign governments, policy makers, industrialists, political and economic experts, and researchers interested in Russian and/or CIS affairs. It is not only independent and professional but also quite critical military publication. They have been busting the overly enthusiastic patriotic drum-rollers in the Russia’s ministry of defense for years, criticizing state integration policy in the military industrial complex and exposing incompetent military acquisitions programs, rampant corruption, and military budget black holes. They typically reveal so much hidden data and provide such an indepth analysis that I suspect this is #1 Russian publication on the US military intelligence list. I am certain you will find many interesting articles in it. While the international media focuses on the confrontations in Abkhazia and South Ossetia and Georgia’s rapid rearmament, the forgotten dispute over Nagorno-Karabakh continues to smolder. Indeed, it seems only a matter of time before the conflict between Azerbaijan on the one hand, and Armenia and Nagorno-Karabakh on the other, bursts into flames again. Back in 1988, the demands of the autonomous oblast of Nagorno-Karabakh, inhabited mainly by Armenians, to secede from Azerbaijan and join Armenia, was the first of the interethnic conflicts that would shake the USSR and lead to a crisis of Gorbachev’s policy of perestroika. After the final extinction of the USSR toward the end of 1991, Armenia and Azerbaijan fought tooth and nail for the disputed region, deploying all manner of armaments of the Transcaucasus Military District of the Soviet Armed Forces that were either «privatized» or gifted from Moscow. Thanks to the higher level of combat readiness of their armed formations, the Armenians maintained the high ground in this battle. Towards the spring of 1994, the Armenians not only kept control over almost all of Nagorno-Karabakh, but also managed to capture a wide «buffer zone.» Most importantly, the Armenians took almost all of the territory that separated Nagorno-Karabakh from Armenia itself, in effect «engulfing» the territory in question. In May 1994 the war concluded through the mediation of CIS leaders with the signing of the Bishkek truce, which enshrined the status quo. This signified the complete victory of the Armenians and the undisputable defeat of Azerbaijan. The Armenian armed forces continue to control over 8% of the territory of the former Azeri Soviet Socialist Republic. The so-called Nagorno-Karabakh Republic is not recognized by any other country, but it rules over this territory with a rather powerful army. In theory, the NKR exists independently of Armenia. However, this independence is clearly a fiction, the republic is de facto a part of Armenia, and the armed forces of the NKR are merely the extension of the Armenian armed forces. It is perhaps indicative that Robert Kocharian, President of Armenia from 1998–2008, was earlier the President of the NKR. Like other unrecognized republics in the post-Soviet area, the NKR has become a kind of «black hole» in terms of international law, and with respect to the Treaty on Conventional Armed Forces in Europe (CFE) in particular. Armenia lost eight thousand lives in the conflict. Azerbaijan lost 25 thousand, and took in 417 thousand refugees from territories occupied by Armenian forces. Since then, a kind of brittle truce has endured in the South Caucasus for 14 years, punctuated occasionally by military incidents. In spite of the truce, the standoff between Armenia/NKR and Azerbaijan is comparable to the front lines during the First World War. For Azerbaijan, the issue of «restoring its territorial integrity» is a key issue of domestic and foreign policy. Azeri politicians have been promising to «defeat the Armenians» and to «take back Karabakh» for years, but in the past few years they have actually accumulated the resources necessary to accomplish this task, thanks to the large revenues accruing from sales of Caspian oil. Indeed, the Azeri economy has grown rapidly since 2000, outpacing all other post-Soviet republics, reaching a record of 29.3% growth in 2007 and 15% in the first quarter of 2008. Government expenditures have increased by a factor of ten over 2002-2008. The sharp growth of oil revenues to the budget has allowed Azerbaijan to increase its defense expenditures by a factor of nine since 2004: from 144 million USD in 2003 to 1.2 billion USD in 2008, which accounts for about 4% of Azerbaijan’s GDP. Moreover, according to a recent announcement of President Aliyev, total defense expenditures for 2008 will reach $2 billion. This figure is comparable to the entire state budget of Armenia, which is projected at 2.5 billion USD for 2008. While Aliyev may be exaggerating Azerbaijan’s defense expenditures, the general tendency is clear enough. High levels of defense spending have supported a broad program for the modernization and reequipping of the Azeri armed forces, which is beginning to affect the balance of forces between Azerbaijan and Armenia. The armed forces of Azerbaijan originated as informal groups of anti-Armenian fighters in 1989–1991, but they assumed the character of regular forces of the National Army of Azerbaijan after December 1991, with the dissolution of the Soviet Union. From 1991–1993 Azerbaijan acquired most of the armaments of the 4th Army of the Soviet Transcaucasus Military District, including three motorized rifle divisions (23rd, 60th, and 295th) and the 75th motorized rifle division in Nakhichevan, and half of the armaments of the 104th airborne division in Ganja. Moreover, Baku received part of the Caspian navy with its entire coastal infrastructure, including some aviation and air defense assets. By mid-1993 Azerbaijan possessed 458 tanks, 1264 armored vehicles, 395 artillery and mortar launchers, 63 multiple launch rocket systems (MLRS), up to 100 air defense systems, 53 military and 52 training aircraft, 18 combat and 15 transport helicopters, and up to 30 ships and cutters. Azerbaijan acquired over 100 thousand pieces of small arms and over 11 thousand carloads of ammunition. A significant proportion of these armaments was lost during the Karabakh war. According to published sources, 186 tanks, 119 armored vehicles, and 59 artillery systems were completely destroyed, and a significant amount of equipment was damaged and could not be returned to service, including 43 tanks, 114 armored vehicles, and 51 main guns. The Azeris lost much of their armor on territory captured by the Armenians, who proceeded to repair the equipment and put it back into service. The Armenians also took down 20 Azeri aircraft and 21 helicopters. For their part, the Azeris captured 23 T-72 tanks, 14 armored vehicles, and nine main guns. To make up for their losses, the Azeris had already begun during the war to purchase arms from Ukraine, including 150 T-55 tanks, eight MiG-21 fighters, and two Su-17 fighter-bombers. After the signing of the truce in 1994, Azerbaijan still had enough armaments to equip its army. Indeed, some of its armor had to be scrapped to comply with the CFE Treaty. No significant procurement had been made for almost a whole decade, until oil revenues began to take hold. And when Azerbaijan began once again to procure armaments, it sought relatively modern, heavy weapons from the former USSR, notably Ukraine, which became the main source of weapons to Transcaucasus, including the powerful 300 mm 9K58 Smerch MLRS with a range of 70 km. From 2007, Azerbaijan also began to acquire arms from Russia. In particular, Azerbaijan was the first to place an order for the new Russian BTR-90, signing a contract with the Arzamas Machine Building Plant for delivery in 2008 of a few BTR-90s and 70 BTR-80A. One of the conditions of the agreement reached in 2002 over the status of the Gabalina radar station was the provision of military assistance to modernize Azerbaijan’s air force and air defense systems, the training of Azeri military in Russia, and repair services for military equipment. As for NATO, in spite of Azerbaijan’s fairly active assertions of its intentions to join the alliance, to meet NATO standards and the like, cooperation with Western countries has been limited to relatively modest military assistance and training. Turkey has provided the greatest amount of aid, reaching a total of 170 million USD in 2005. Azerbaijan has also purchased small arms and modern communications equipment from American and Israeli firms on a purely commercial basis. Azerbaijan is now putting the emphasis on acquiring new aviation equipment for its air force. in 2005, it signed a contract with Ukraine for the delivery of 12 MiG-29 fighters, two MiG-29UB aircraft, and 12 L-39 training aircraft. It bought 12 Su-25 assault planes (probably Czech) and one Su-27UB from Georgia. Negotiations with Ukraine for the acquisition of Su-27 fighters and Su-25 assault planes have also been reported, along with modernization in Ukraine of Azeri Mi-24 combat helicopters by the South African ATE company’s Super Hind Mk-III program. Azerbaijan is reportedly looking to acquire 24 of the new Chinese FC-1 light fighters. It is also purchasing UAVs from Israel, all of which attests to the clear intention of the Azeri military leadership to achieve air superiority as a top priority. In late 2005, Azerbaijan established a Ministry of Defense Industry, endowed with significant resources. In 2007, the ministry announced the launch of series production of 29 weapons systems along with parts and ammunition. The state defense procurement order for 2008 included the creation of 80 new types of military items and the production of 444. The national budget for 2008 allocated 66 million manat to the Ministry of Defense Industry. New production will be established primarily in cooperation with Western states. By 2008, the Azeri armed forces have overtaken the Armenian once in terms of active personnel (73 thousand) and armament. However, this numerical superiority is compensated by the army of the unrecognized NKR, which has about the same amount of arms as the official land forces of either Armenia or Azerbaijan. Moreover, over the past 14 years the Armenians have worked constantly to improve and fortify their line of defense in Nagorno-Karabakh, reaching from the Mrav heights to the Araks river. Furthermore, Armenia is part of the Russian-led CIS Collective Security Treaty Organization (CSTO), and about four thousand Russian troops are deployed in Armenia, mostly at the 102nd base in Gyumri. Nevertheless, the rapid growth of Azeri defense expenditures, driving the strong rearmament of the Azeri armed forces, is putting into question the ability of the Armenians to maintain the military balance with Azerbaijan. This is particularly pertinent with respect to Azerbaijan’s buildup of its air force and projected acquisitions of modern and high-precision weaponry. Official figures probably understate the volume of Armenian defense spending, but several Azeri estimates put the actual defense spending of Armenia and the NKR for 2008 at about 800 million USD, which seems likely. But the overall trend is clearly in Azerbaijan’s favor, and it seems that Armenia will not be able to sustain an arms race with Azerbaijan’s oil-fueled economy. And this could lead to the destabilization of the frozen conflict between these two states. Great article, thanks for posting it Zoravar. And what are your opinions on the military parity in the region as well as the training and battle readiness of the Armenian Armed Forces (including Artsakh), and those of azerbaijan? An older synopsis, but still relevant. The Russian-Armenian military cooperation develops quite dynamically. Not long ago, Russia lent a sympathetic ear to Armenia's request concerning training of up to 150 officers. Complicated situation in the Caucasus forces the authorities of Armenia to pay unfeigned attention to national defense. According to official data alone, the 2004 Armenian state budget allocated almost $82 million for military needs, an almost 10% rise against war spending in 2003. Estimates of the International Institute of Strategic Studies (London) show that in 2002 Armenia was the CIS leader in the arms spending to GDP ratio - 6.4%, an equivalent of $162 million. The CIA claims that as far as this particular parameter is concerned, Armenia is the 11th in the world; it spent $135 million on its army in 2001. When the closed parliamentary hearing of fulfillment of the 2003 budget was over not long ago, Armenian Defense Minister Serzh Sarkisjan said that arms spending would be increased next year again. Sarkisjan refused to elaborate but said that the Armenian national army was initiating a program of rearmament. It should be noted that the population of Armenia, not exactly a wealthy country, does not object to these measures taken by national leaders. The population is perfectly aware of the undeclared war with Azerbaijan that is under way. Serious clashes are regularly reported in the areas where Armenian and Azerbaijani troops face each other; shots have been fired by sharpshooters for a decade (ever since the cease-fire on the Karabakh front was signed). Moreover, official Yerevan positions itself as a guarantor of security of Karabakh. Turkey is another potential enemy. Diplomatic relations with Turkey have never been established. Ankara is still blocking the border with Armenia and pursuing an openly anti-Armenian policy. Sociologists of the Armenian Center of National and Strategic Studies discovered that 47.5% respondents in Armenia believe that the war with Azerbaijan may be resumed within five years, and 7% more expect a Turkish aggression within the same span of time. Armenian national army is considered one of the most combat ready in the Caucasus. These days, it is over 60,000 men strong. According to the CIA, there are 810,000 men in Armenia aged 15 to 59 and almost 650,000 of them are fit for combat. Most experts say, however, that mobilization resources of Armenia amount to 300,000 men, i.e. almost 10% of the total population (over 3.2 million). 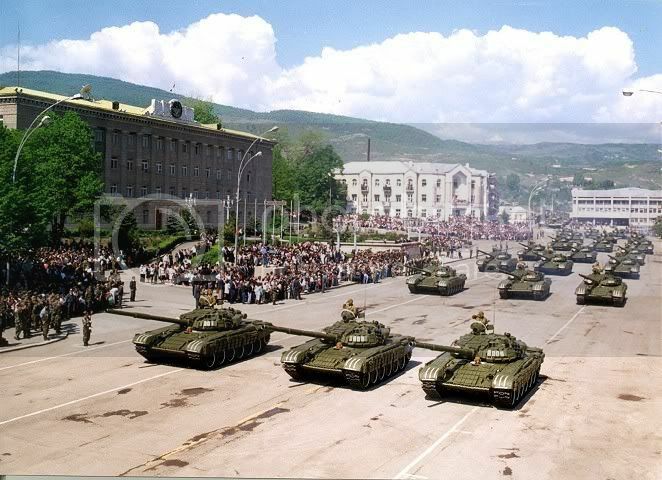 Under the Treaty on Conventional Arms in Europe, in 2001 Armenia declared 102 T-72 tanks and 204 armored vehicles (most of them infantry fighting vehicles and armored personnel carriers). With the military hardware the Treaty on Conventional Arms in Europe does not apply to, Armenia has up to 700 armored vehicles. Its artillery comprises 225 pieces of 122 mm and larger calibers including 50 multiple rocket launchers. The Armenian Air Force includes five SU-25 ground-attack aircraft, one MIG-25, 35 helicopters (the latter include twelve MI-24 attack helicopters), and 3,000 servicemen. Yerevan intends to build up this component of its Armed Forces. Not long ago, Defense Ministry of Slovenia proclaimed the sale of ten SU-25s to Armenia (nine SU-25K one-seaters and one SU-25UBK two-seater). The consignment will cost Armenia $1 million. Armenia bought two IL-76 military transports from Russia not long ago. The transports were bought at Russian domestic prices and made it to Armenia together with Defense Minister of Russia Sergei Ivanov. Armenia builds up its Air Force in the hope of making it a match for the Azerbaijani, but its antiaircraft defense is considered the best throughout the Caucasus. Armenian antiaircraft defense comprises an antiaircraft missile brigade and two regiments armed with almost 100 antiaircraft complexes of various models and modifications (Osa, Krug, S-75, and S-125). Numerical strength is estimated at about 2,000 servicemen. Armenian antiaircraft defense developed in a hurry in the war over Karabakh when Azerbaijani Air Force regularly and energetically bombarded Armenian trenches and settlements both in Karabakh and in Armenia's own border districts. There was nothing Armenia could do about it then. By 1993, however, it already had a formidable antiaircraft defense in Armenia itself and in the Republic of Nagorno-Karabakh. Its deployment cut Azerbaijani advantage in the sky to the minimum. These days, the Armenian skies are controlled by Armenian and Russian antiaircraft defense units on joint combat duty since 1999. There are at least 30 MIG-29 fighters and a regiment of S-300s quartered on the territory of Armenia. Armenia is a member of the Organization of the CIS Collective Security Treaty. As such, it participates in all events organized within its framework. In any case, Russia is Armenia's oldest and traditional ally. Ever since the regaining of sovereignty, the tandem of Moscow and Yerevan has served as one of the few examples of bona fide military-political cooperation in the Commonwealth. There is practically no discord between Russia and Armenia in this sphere. Russia and Armenia together defend the Armenian airspace or, rather, the southern border of the Commonwealth. Armenian borders with Turkey and Iran are manned by almost 2,000 Russian bodyguards who serve shoulder to shoulder with their Armenian counterparts. Yet, it is the 102nd Military Base in Gyumri that is Russia's major outpost in Armenia. Unlike Tbilisi or Baku, official Yerevan never brings up the subject of withdrawal of the Russian troops. When Sarkisjan is asked the question, he never answers believing it a rhetoric question. Armenian society regards the Russian troops as a covering force defending it from the Turkish aggression. Until recently, the 102nd Military Base had 74 tanks, 17 battle infantry vehicles, 148 armored personnel carriers, 84 artillery pieces, up to 30 MIG-23s and MIG-29s, and a regiment of S-300 antiaircraft complexes. In the last eighteen months, however, a great deal of military hardware was moved there from Georgia. Armenia gave the land and objects used by the 102nd Military Base over to Russia and covers some communal services. Officer training is another sphere of Russian-Armenian military cooperation. In the first years of sovereignty when Armenia did not have military educational establishments of its own, officers of its army were trained in Russia. Even now when Armenia has a military college on its own territory, the Armenian officer corps honors the tradition and is trained at Russian military educational establishments. On a visit to Armenia in late May, Ivanov said that 600 Armenian servicemen are being trained in Russia. "Armenia asks for the permission to send 150 servicemen to Russia in 2005, and Russia gave its consent," Ivanov said. It seems that Moscow and Yerevan do not plan to stop. The first meeting of the joint Russian-Armenian government panel for military-technical cooperation will take place this autumn. According to Prime Minister Mikhail Fradkov, Russian factories will participate in the Armenian program of military hardware modernization. He even said that Russia is prepared to supply the necessary spare parts an equipment. Belarus is another ally of Armenia in the Organization of the CIS Collective Security Treaty. The two countries signed a treaty in 2002. 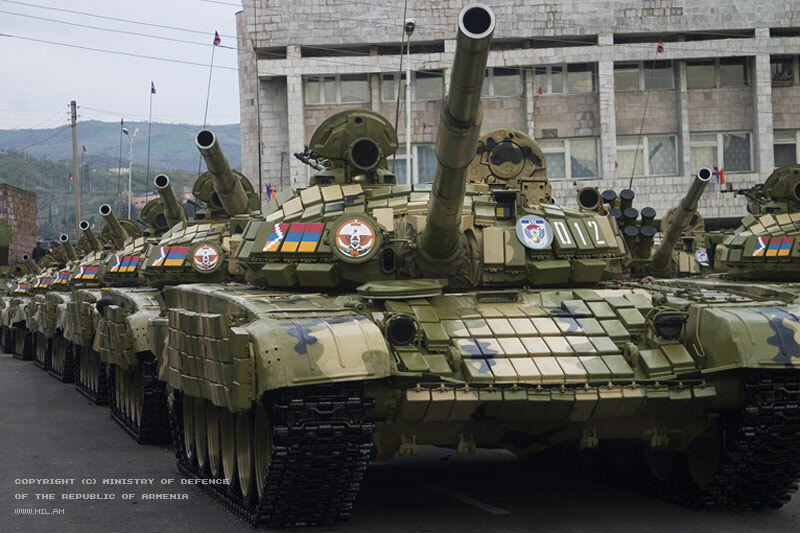 Under the document, Armenia will receive light weapons, armored vehicles, ordnance, and optical devices in return for spare parts and gadgets for military hardware. Armenia also intends to have its heavy military hardware upgraded at Belarusian factories. Lieutenant General Sergei Gurulev, Chief of the General Staff of the Belarusian Armed Forces, says that the Armenian-Belarusian military contacts "become systematic and deliberate." represented) was run on the territory of Armenia in 2003. Armenian cooperation with NATO is mostly declarative for the time being, but the United States - the country steadily upping its clout with countries of the region - has far-reaching plans with regard to Yerevan. In early 2003, the Pentagon announced several major military programs in the Caucasus. Washington's military aid to Armenia in 2004 will amount to $5 million even though the US Administration intended to restrict it to $2 million at first. Armenia and the United States signed a military-technical cooperation accord in April. Some articles in the American media imply that the accord specifies the use of Armenian airfields by the USAF. to Iraq. Moreover, Armenia even permitted the United States to modernize its communications, one of the most vulnerable items. Yerevan expects to get communications means from American companies. The deliveries will be paid for by the White House (the sum amounts to $7 million). Commenting on it, Sarkisjan said that Russia is quite understanding. "We are allies. It means that the strengthening of one partner will benefit the other," said Sarkisjan. "We initiated the process a year ago, and I found our Russian colleagues quite understanding." He said that from military cooperation with the United States Armenia expected to up combat potential of its own army. performed flawlessly in the hostilities in the 1990's. And this assessment by our very own CIA representative, Richard Giragosian. New munitions plant is seen as a step towards a more self-sufficient defence industry. By Gegham Vardanian in Yerevan (CRS No. 418 07-Nov-07) Armenia has started making ammunition for its armed forces, in an attempt to keep pace with other defence industries in the South Caucasus. A munitions factory re-opened in September after a refit costing 4.7 million US dollars. The plant is owned by the Armenian firm DG Arms Cooperation, the country’s only defence manufacturer. Almost all of the country’s weaponry comes from Russia. The plant’s current capacity is 100 million bullets a year, most of which is intended for the Armenian armed forces. Partev Mushegian, director general of DG Arms, said the company intended to invest an additional 22 million dollars and increase annual output by 70 million bullets. Next year, it plans to produce flak jackets as well. “The factory plans to move onto the international market after it has started meeting the country’s needs,” Mushegian told IWPR. He said the factory aimed to make bullets that complied with NATO standards, so that they could be sold abroad. “Our products will be exported - with the permission of the Armenian authorities - to countries that are not subject to United Nations or European Union sanctions, and that are not counter to the interests of Collective Security Treaty Organisation members,” said Mushegian, referring to the CSTO, a defence grouping of former Soviet states. The factory was reopened following the privatisation of two companies, Neutron and Bagavan. Neutron’s factory first started making bullets in 1986 and carried on through the Nagorny Karabakh conflict. But it was unable to keep up with demand, and Armenia had to start importing ammunition. Over the past decade, production all but stopped. The re-modelled Yerevan-based plant employs 120 workers, and there are plans to open a smaller branch factory in the town of Abovian. The government has not subsidised the new plant, but says it is keen to foster a defence industry. “We need to upgrade our factories,” Prime Minister Serzh Sarkisian said at a ceremony to mark the opening of the munitions plant. “This is directly linked to our country’s defence capability. I think that if the factory works at full capacity, our needs for a number of types of ammunition will be completely covered.” Artur Agabekian, a former deputy defence minister who now heads the Armenian parliament’s defence, national security and interior affairs committee, told IWPR, “It is satisfying to know that a factory run on private capital is producing ammunition. If the state handles its orders properly, then I am certain that investors will emerge who will be ready to put their money into munitions manufacturing and repairs. We should be able to assist this process.” Experts say the launch of the factory is a small step towards making Armenia’s military more self-sufficient. The government’s defence budget is set to grow by 20 per cent in 2008 to reach 380 million US dollars - around ten per cent of total planned expenditure. As a CSTO member, Armenia benefits from a 30 per cent discount on arms purchases from Russia, its main supplier. Prime minister Sarkisian said the launch of the factory had nothing to do with the unresolved conflict with Azerbaijan over Karabakh. Another old but interesting report on the Artsakh military. Among the multitude of armed formations, which have sprang up in the post-Soviet sphere, the Defense Army of Karabakh turned out to be one of the most battle worthy. lines and is not accepted de-jure anywhere. There is no need to explain to the participants of enforcement of a "constructive order in Soviet Transcaucasia" who are the fedayees. Armed with anything they could get their hands on and unclear who they were controlled by, the bearded guerrillas (partisans) stood against a no less exotic Azeri fighting force. In the beginning stages, military weapons were a big rarity here and the character of the military actions was very similar to gang fighting on a city level using common makeshift weapons. In those times Soviet generals didn't hide their contempt towards this "wild war" and its participants. Up to the point when blood still wasn't being shed in abundance and humor on military themes wasn't too dark, in many headquarters spread throughout "smoldering" Caucasus, the Karabakh conflict was referred to as the battle between shepherds and cattle breeders. The irony was present even when the fighting sides transferred into tanks and planes, when instead of gradoboykas (Translator's note: guns used for agricultural purposes) they started using frontline artillery - as the military warehouses and equipment in the region turned out to be more than sufficient. True, in Moscow they still hoped that these "peoples' military specialists" will never be able to adapt the modern military hardware which they inherited after the division of Soviet Union. But the hopes were dispersed when the so-called Karabakh War, which in Artsakh is considered Patriotic, went according to all rules of military art... They don't wear beards in the NKR Army any more. It is not outlawed, but it is also not encouraged. The outward appearance is clean cut - the camouflage is sawn on the local fabric from Greek material, thus strikingly resembling NATO. And if we put a Russian soldier next to one from Karabakh, the visual comparison, unfortunately, won't be in our favor. At the least, we didn't see a single soldier with a pitiful appearance, the likes of which are abundant even in Moscow. People wear the uniform with dignity here, even women and instructors of military-sporting schools: 70 percent of the population directly or indirectly are considered potential "military assets". The military budget of NKR is an impressive 20 percent of GDP. These kinds of spending percentages are not permissive, neither in the United States nor Russia. But to make up for it, in the past ten years, gone like a moment, they created here a well functioning military structure: infantry, armored, rocket-artillery forces, air defense forces, rear logistical services and all the necessary military services including, a reconnaissance battalion and a special forces unit formed on the base of national guard... In reality, here they know not only the appropriate place for a joke, but also the appropriate time. They warned us still in Yerevan that Karabakh Armenians are not only the most kind hearted but also the most warlike: from the four famous Soviet Armenian marshals, three were from Karabakh. People here, as is appropriate for the highlanders, are serious with a no-nonsense character. If the decision is taken that everybody must go through military service, everybody does it, regardless of the position of the parents, two years from start to finish. the elite Moscow facilities can be jealous, was built from zero. They almost worship their commander in AOK. For example, the massive system of defensive fortifications, which today similar to Maginot Line encircles the entire borders of Karabakh, is unofficially called Ohanian's Line. During the war, they say, Azeris were offering one million dollars for the head of the commander of Mardakert front. out by the elite units, including the Marines, which are now in the rear and are carrying out intense military training under the direction of Turkish instructors - who are not the worst military specialists in the world. That is why the "euphoria of victory", ruling now in Stepanakert, seriously concerns Karabakh command. Today Azerbaijan's army is several-fold larger in number, than the armed forces of Armenia and NKR together. But in Karabakh, they think that these forces are not sufficient to break through the Ohanian's Line so easily. Besides, here they prepare for the possibility of war in real terms: exactly once a week, no matter what, soldiers and officers of Artsakh conduct live-fire training exercises in the field. They are also replenishing their supplies of armaments, even though in the 'pyramids' (armories) there are still war-time machine guns. But the main problem is the officer cadres. From three thousand officers of AOK only forty have served in the Soviet Army. Three hundred more went through training in Yerevan military academy and in Russian establishments of higher learning. Recently Boris Davidov, commander of 4th regiment, graduated with honors from All-Military Academy in Moscow. In the peaceful past Davidov was the graduate of Timiriazevsk Academy. Behind the shoulders of the Deputy Defense Minister lieutenant-colonel Aleksan Aleksanian are the Polytechnic Institute and the academic courses "Vistrel" (Shot). Students from Azerbaijan don't neglect Russian military academies either, but as Moscow instructors communicated to "Itogi", officers from Karabakh are working harder than all the others. In Soviet times there was an axiom: if three Armenians served in a subdivision at the same time, it meant a guaranteed disorder and brothel in the whole stationed division, if there were more Armenians - an utter lawlessness would ensue. In simple terms, it was thought that it would be impossible to create a regular army purely "comprised of Armenians", because it was thought, these people were spoiled by the warm climate and abundance of food and wealth. For AOK this axiom turned out to be false. At one time, Alexander Lebed (famous Russian General and elected governor of Krasnoyarsk, who brokered ceasefire in the first Chechen War), who visited Karabakh after the war, acknowledged, that the battle readiness of AOK is higher than the Russian Army, and there is more order. It was not hard to compare the two, because the military life and methods of training are almost identical. works on the other side of the frontlines at night and in the morning Azeri positions became closer. In some areas two opposing armies are separated only by fifty meters. A tank can cover that distance in one swing. But colonel Davidov is sure that his subordinates will hold: "You can't run from a submarine!" Really, Karabakhis have nowhere to retreat. Excellent thread, enker Zoravar. A question. Do you have any information about how Armenian forces in Artskah are deployed, stationed and/or protected? How do they protect their radars, surface-to-surface missiles/rockets, air defense systems, main battle tanks, attack helicopters, command-and-control facilities, their generals, etc? Are deep bunkers utilized? Is ammunition and weaponry stored throughout the territory in undisclosed locations. Does Armenia have forces within striking distance of the territory? Putting aside geopolitics and Artsakh's military capability, I am more concerned about Azerbaijan's 'first strike' capability. In your opinion, would they be able to knock out Artsakh's defenses with one massive strike? In your opinion, would they be able to knock out Artsakh's defenses with one massive strike? Uhhh, NOOOOOOOOOOO!!!!!!!!!!! Are u stupid? It isn't a matter of numbers, it isn't a matter of weapons, it isn't about who's richer....it's all about brains. It's the hye and the esh Azeri... no matter what u do, the esh will remain and esh.... the israeli scenario is similiar........a tiny country surrounded by an ocean of esh arabs... the esh arab will remain an esh arab and the joo would continue fuking their women. This is the mentality we don't need, we need to be sharp. A rusted sword can not cut. We don't need to underestimate the enemy, or overestimate our own power; that could be deadly.